All transactions are safe and secure with a reliable history in online purchasing behind each of our associates. 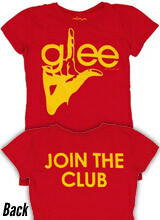 Buy the Glee Join the Club t-shirt to own Glee clothing and merchandise. Don't stop believing! This Glee t-shirt is bound to make you sing as much as the members of New Directions in their amazing final performance of the season. Whether you are a star like Rachel or can barely hold a steady note, it doesn't matter because with this Glee Club tee you'll be ready to join. Don't be discouraged if singing and dancing aren't your talents. Whatever your passion is, never stop believing in yourself. You can watch new Glee episodes on FOX or catch previous seasons on DVD to get tips on how to better your own routine. In addition to the Glee Join the Club tee above, browse the Glee Clothing Gallery for more apparel like men's and women's clothes, kids shirts or hoodies.